Wi-Fi is a wireless connectivity feature that lets you connect Wi-Fi enabled devices to share information or to connect to the internet. 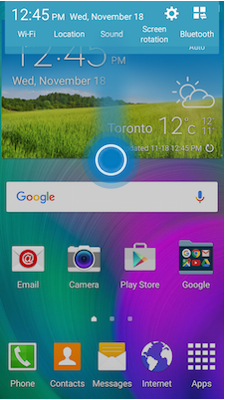 1 Open the Notification Panel by swiping your finger slightly apart from the top of the screen to the bottom. 2 Touch the Wi-Fi icon to turn it on. 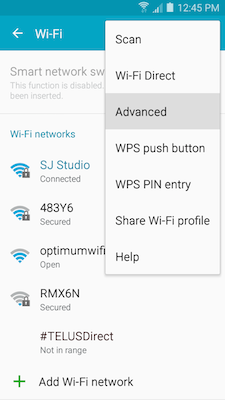 When Wi-Fi is on the device will scan for and automatically connect to any previously connected access points, commonly known as the network. 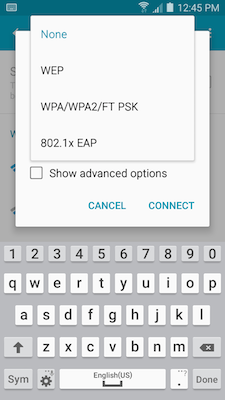 3 Touch Wi-Fi under the Connections tab. 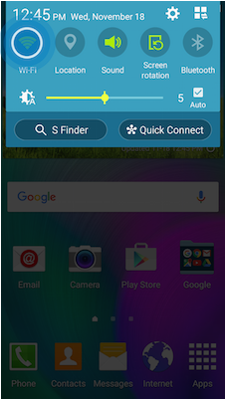 4 Touch the slider to turn Wi-Fi on. 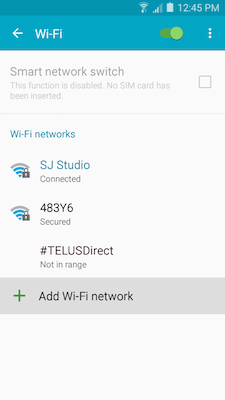 5 Under Wi-Fi networks, touch the network you want to connect to. 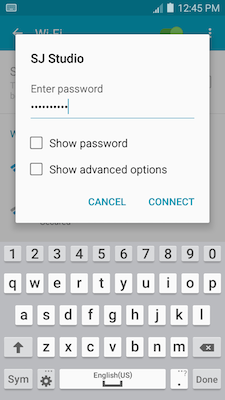 6 Enter a wireless password if necessary. 4 Touch Add Wi-Fi network. 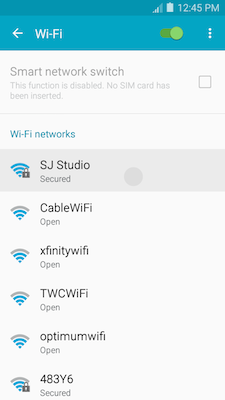 5 Enter the Network SSID. 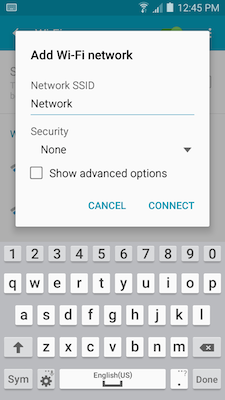 This is the name of the network you are connecting to. 6 Select the Security level of the network. If you select a security level that does not match your access point, you will not be able to connect. 7 If the network is secured, you will also need to enter the password. 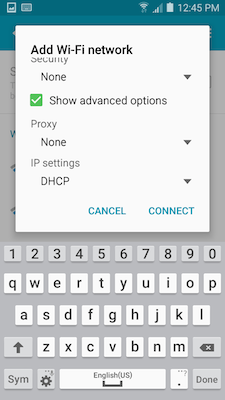 You can mark the Show advanced options checkbox to configure the Proxy and IP settings. 8 Touch CONNECT to store the new information and connect to the network. Displays when Wi-Fi is connected, active, and communicating with a Wireless Access Point (WAP). 4 Touch More options (top right corner) > Advanced. 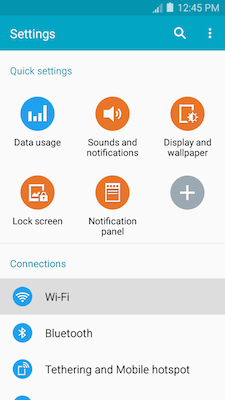 • Network notifications: Receive a notification when new Wireless Access Points (WAPs) are available. • Sort by: Sort Wi-Fi networks by Alphabet or Signal strength. • Keep Wi-Fi on during sleep: Specify when to disconnect from Wi-Fi. 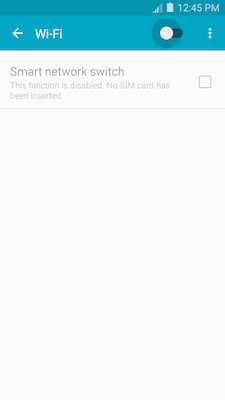 • Always allow scanning: Allow Google location service and other apps to scan for networks, even when Wi-Fi is turned off. • Install certificates: Install authentication certificates. • Wi-Fi timer: Automatically connect to or disconnect from Wi-Fi networks. • MAC address: View your device's MAC address, which is required when connecting to some secured networks. • IP address: View your device's IP address (not configurable).